This edition of the Akili Trust Newsletter is dedicated to the bursary students and gives you a chance to hear about their life, their schools and their hopes and ambitions. We have tried where possible to use their voice to give you a sense of their personalities and character. There are still tickets left for this popular event – please note the email address for booking. There are currently 20 Akili Bursary students, so raising the money for this is a key part of our fundraising efforts. This year’s bill will be almost £6000. The average cost of our secondary school bursaries is now £280 per year. In Kenya, Government-funded secondary schools are divided into three categories and students are allocated by the results they achieve in the test taken at the end of primary school. The most prestigious category is the national school and we have only one student, a girl, who has achieved this honour. These schools are very expensive so her place is 50% funded by the local Constituency Development Fund. The next category is the provincial school, and a fair number of our students have been awarded places at these. The final category is the district school, also good schools. There is also a network of private schools of varying quality. Secondary schooling lasts for 4 years, from 14 – 18 years of age; it is competitive and there are regular tests, in which Akili students are required to achieve a consistent grade. Many secondary schools are boarding schools, which are seen to provide more facilities and are particularly beneficial as students can study in the evening, as their homes are unlikely to have electricity. 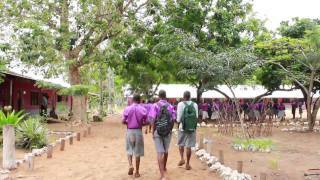 The local secondary school we support directly, Canon Mweri, however, is a mixed day school and is offering wide access to local students. Our students are selected by a local panel made up of the librarian, the headteacher, library management committee and impartial representatives. The criteria for selection include academic ability, attitude to study, and family circumstances. As an example, this January at Kakuyuni, there were 10 students, 5 girls and 5 boys, who all qualified for the 2 places we had available – so it was a very difficult choice for the team. My siblings feel happy when I am away from home because they know that education is more important than staying at home idle, and it is clear that the idle mind is the devil’s workshop. My family is Dad, Mum and 6 children, 3 sons and 3 daughters, a full balanced family. Dad being the head schooled to secondary school and was unable to further his studies and my dear Mum – a primary leaver – she’s a business lady. I really love my parents’ support and motivation. It is with great sorries we are only remaining with my mother after my father passed away in 2010; that year I was completing my KP exams. My mother provides us with what we need with the help of my uncles. My brothers and sisters have an interest in learning because they all say that they want to test the life in high school. My family give me great care which is to make sure I am doing well all the time and give advice on how to manage my time properly to make sure I utilise it well. In my family I am the only one who have stepped the door to secondary. I am happy about it. I have 8 brothers and 4 sisters and I am the first one. My brothers and sisters are really enjoying since I was admitted to Form 1. They know that one day, one time I will be somebody else but not the one they knew before. Since I am the first born I am really showing them good examples. Most of the students get up between 4 and 5 am, sometimes for prep, as is the case with David and Khadija in their respective schools. Both talk about going to prep from 5 to 6am and then to breakfast. The school day is 8.30 to 4 with 40-minute lessons and usually sport or some other activity after school. They do a mixture of sports including football, running and volleyball, but David enjoys “participating in games, especially lawn tennis; I was in the regional level where I was beaten”. Class sizes vary: Khadija says that there are 64 in her class; Francis says he has “only” 47; Evans 45. One day-school student says that he goes “to school at 5.30 am and at exactly 6.30 always I’m in class revising my work. And I get to school by means of bicycle”. Rita likes “non-fiction as you may find information about what goes on around the world”. David likes “the Pacesetters books particularly ‘Three instead of one’ which is my favourite book and makes me love reading”. Nimwaka and Leah both say that the reference books and the revision guides have helped improve their studies and Evans that the non-fiction means he can do a lot of research to help his holiday assignments. Faustina says that “the library has made the community enjoy so much. Since the library offers reading material it has uplifted the living standard of the people”. Baraka likes to “read the newspapers”. Leah says that “the story books just make me happy and I read them as I rest. I usually read these books during the holiday when I am always in the library”. Masha likes “the ‘Hardy boys’ as I like it because of the hardships they undergo, they don’t give in; they work it through”. Most of the students are really keen to have more experience of computers. Some say they have had limited experience to date and are looking forward to learning more. Some use them for typing letters, for making research notes, for learning the meanings of words and how they can be used, for “playing games, if only I am free after studies”. The Akili students are required to work in the libraries during their school holidays. This is really to give them a sense of giving something back, but they all talk about the sense of community this brings and how they can share and help each other with work. Sometimes the students are required to attend holiday tuition, which their parents often can’t afford and this is an issue for us as we fund the school places 100% but not any additional costs. One student says “the library has been a source of experience-sharing hence exchanging ideas and experience from different schools. It is so fantastic”. Another that he goes to the library “to discuss and revise with friends and also teaches some maths problems to younger students”. David (Form 3): my ambition is to become a doctor so the sciences are important and I want to work hard and pursue medicine since completing school is not the end of learning i.e. research so as to help my dear villages. Being a doctor – “Dr David” Wow! – It will enable me to save life thus becoming a life saver. Baraka (Form 3) wants to be an optician in the future, this is because I myself am suffering from an eye problem. In the evenings he likes to listen to news, to get to know actually what is going on in the world. And by doing this, I exposed myself to different things. Leah (Form 1) says: when I was selected for the school I was happy but when I reached there I felt like I should come back home. She wants to be a doctor and change the way our family is now. Masha (Form 1) would like to be a pilot and I would like to work hard in school so that I can come and help my parents, as there is a lack of education in my family and I am the only one at secondary school. Khadija (Form 1) says that one day I would be somewhere working and I will be earning something to help my family. I have realised that I am benefitting some thing good from it I am passing my exams but to me is not enough. I want to get more. Francis (Form 2) wants to have a job and be an engineer, and likes doing experiments in the laboratory with a friend and that physics is what he enjoys the most. Davinah (Form 2) says my dreams can come true of becoming a doctor and that she likes reading in the library in order to fulfill my goals. I always commit myself in books. Evans (Form 3) says we normally have group discussions where we discuss different subjects, where maybe I have a weakness my friends always assist me and I also assist them. When I leave school I would like to be a lawyer because I want to fight for rights of my fellow citizens because I am seeing a lot of injustice in the community and the country at large. Nimwaka (Form 2) says I am learning hard to see that I achieve my goals. My dream is to be a doctor and I’ll make sure that I achieve my dream. Rita (Form 1) says she is a girl of substance who is studying in school for a reason and a season and wants to become a doctor to help people in my home place as they are suffering because they lack doctors who may help them. When I am in class I like participating in group discussion and debating. This is the time to understand many things. Saturday 11 May is a new event in the Akili calendar with Steve Grocott, musician and member of The Drones, who was part of the group that visited the libraries in October 2012. Tickets for this event will be on sale at the door.